As you know by now I'm sure, Elizabeth's patterns are different than most modern patterns. I definitely suggest reading through this whole pattern before casting on to get a feel for it (it's less than a page long so it won't take much time). If you need to, write down the important numbers and measurements on a separate piece of paper to help yourself along the way. This was the first time I've knit this pattern, but I'm sure I'll knit it again. It's easily customizable. I knit my sweater at 5.5 stitches per inch, which produced about a 12 month size. You can use different gauges for other baby sizes if you like, or easily add another increase row for a larger size. Of course there's also Flint Knits' February Lady Sweater pattern written for adult sizes, which I also successfully downsized to a sweater for Camdyn. 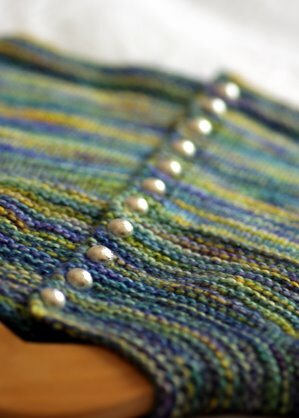 If you'd rather work with more detailed instructions you might prefer this pattern to EZ's. I'm excited to give this sweater to Serena later this year. 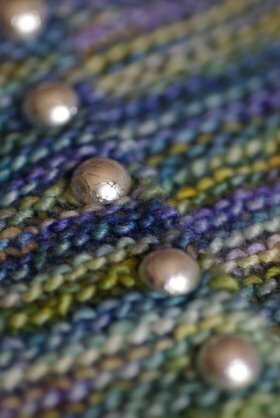 The silky yarn and shiny buttons really make it feel like something special. 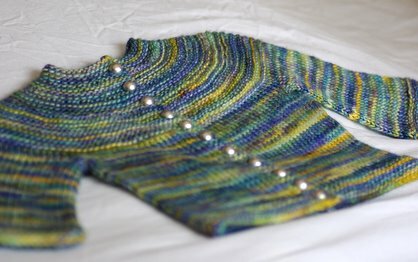 Because I knew the lace pattern would be hidden in this variegated yarn, I decided to knit the body and sleeves in stockinette. It really gives the sweater a different look. 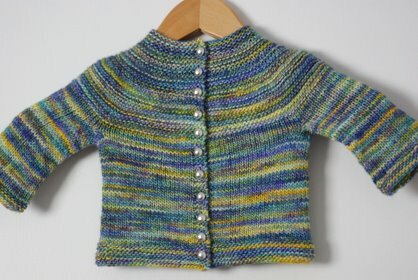 I think omitting the lace makes this pattern suitable for a baby boy as well--though I'd probably use a tweedy yarn and wooden buttons to make it more masculine. 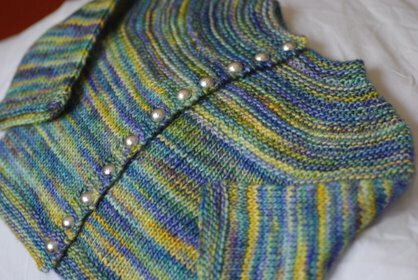 I loved knitting once again with Malabrigo Silky Merino. Surprisingly, I haven't knit with this yarn all that much. I'm not sure why that is, but maybe it's because it's almost too pretty sitting in my stash that I don't want to use it all up! After winding my two skeins of Indiecieta, I noticed they were significantly different from each other. One had lots of golden yellow throughout, and the other was much darker with many different blue tones. I decided to alternate the skeins every two rows. At first I thought it would be annoying, but it turned out to be super easy. I'm so glad I did because I would have ended up with two sleeves that wouldn't have matched the rest of the sweater at all!